For such a tiny island in Indonesia, Bali sure does pack a ton of wonders. While many start and end their time along the beaches of Seminyak and Cliff Vistas of Ulu Watu, we prefer to head inland to the cultural epicenter of Bali. With Mt. Agung always looming in the distance majestic and proud, where villages preserve local handicraft techniques that have been handed down through the generations, and where the heart gets swept away. 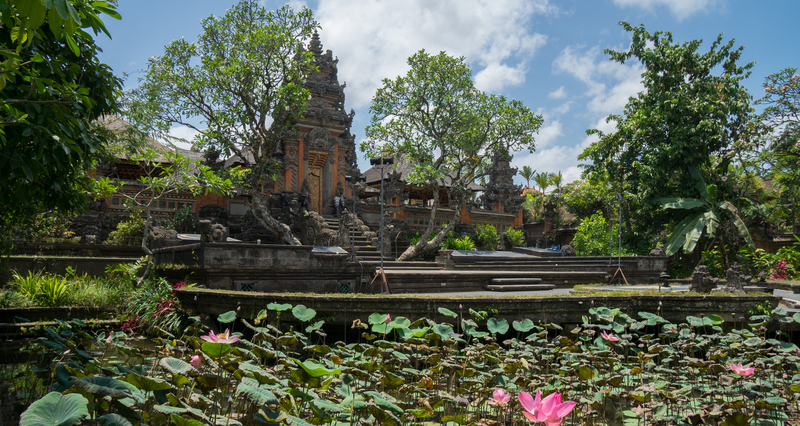 Thus, no trip to Bali is complete without venturing inland to the cultural haven of Ubud. Rice paddies surround the town and the sounds of Balinese ceremony and smells of incense fill the air. Take a hint from us and extend your stay, kick back, and remain on Balinese time! Though Om On Yoga does not arrange nor include flights for our retreats, we would be happy to provide our opinions on possible routes. Denpasar. Roundtrip airfare is typically between $800-$1500, and travel time around 30 hours. Typically West Coast flights originating in San Francisco and LA travel through Hong Kong, Singapore, Sydney, or Jakarta and then onto Denpasar. Roundtrip airfare is typically between $700-$1300, and travel time around 22 hours. Is all transportation provided while in Bali?